The best SEO tools will save you valuable time, bring great insights and can quickly help you explore search engine ranking challenges and opportunities. With some of this seo tools you will need some degree of experience to get the very most out of them. Your competition is likely to be using these tools and others like them, so you should think about reviewing them too. Authoritas is a SEO software and content strategy automation platform for eCommerce businesses, agencies and enterprises. The Authoritas SEO platform helps you increase your organic search performance and increase revenues. Helps you improve your SEO site’s performance in search. Get access to free reports, web crawling tools and indexing resources. Specially important to SEO optimise for bing if your website targets Americans where Bing has bigger share than in Australia. Both offer free, basic SEO site analysis tools that grade sites on how well they’re optimized for target keyword phrases. offers local SEO tools and local search engine marketing services for local business, agencies and consultants. BuzzStream SEO tool is web-based software and automated tools for researching link prospects and building and managing influencers. Helping you to get the right back links to your site and creating buzz around key influencers. Buzz Stream also has a meta tag extrator tool where you can extract any url meta title, meta descriptions, meta keywords. One way to build high-grade backlinks without creating new content is broken link building. No one likes a 404 page sitting on their pages so if they can find something that’s better, they’d replace it immediately. But most marketers and content producers don’t even know they’ve got broken links on their pages, but you can let them know. Check My Links is a Chrome extension that lets you check a page for active and inactive links (broken links). Find your competitors top high quality links and domain trustworthiness pointing to your competitors sites. Cognitive SEO offers a great Content Assistant and keyword tool that is like the Google keyword tool but so much better. The tool is like a low-hanging fruit for any content marketer or seo consultant, it allows you to save a lot of time and effort while your website starts to increase search traffic and improve rankings in the search engines, offering good user experience all at once. You’ll be able to create quality content by offering valuable organic search results to the user. They offer a free trial for 14 days then you got to pay $99/month. A great wordpress plugin that tells a visitor or robot that has recently visited your website that they don’t necessarily need to waste time reloading site images or brand new content. Caching is a great way of keeping site content closer to the user to enable a faster load time. CopyScape is duplicate-content-detection software and a plagiarism checker, and it’s another favourite of SEO experts. A free version is available. Copyscape Premium will analySe a site’s entire content for 5 cents a page. “Within minutes you’ll have a plethora of data about which pages on your website contain duplicate content, the exact content highlighted for you, and a full list of other Web pages that your content was also discovered on. Every link in SEO revolves around content. That’s why there’s a lot of talk about generating content ideas. And all search engines hate copied content. It’s called duplicate content in the industry, and the Google Penguin update goes after sites that have duplicate content on them. But you don’t need to wait for that to happen, you can use Copyscape to stay clean. The free version of Copyscape allows you to scan content on a particular link for its duplicates on the web. Crazy shows you a “heat map” of where your site’s visitors tend to click most frequently. Plans start at $9 a month. The tool helps you discover which pages are most important to your visitors, according to Dave Davies, CEO, Beanstalk SEO. Learn how to perform your own DIY SEO website audit. Best SEO Consultants and Top SEO trainers in Sydney, Australia. allows you to analyse traffic volumes by country and keyword competition. GOOGLE ADWORDS – TRAFFIC ESTIMATOR Your boss is telling you SEO spend is a waste, you can find out keyword market value and tell her the value of your organic traffic. Check your analytics dashboard for the percentage of visitors your site is getting through mobile search, and you’d see why your site should be optimised for those mobile visitors. If you’re not sure if it is, enter your site into the Google mobile friendly test page. Google trends is a great FREE SEO tool that allows you to compare keyword trends, hot topics and hot searches. GOOGLE INSIGHTS FOR SEARCH Google Insights for Search has been absorbed by Google Trends around Aug 2012; the combined tool keeps the Google Trends name and exists at google.com/trends. The google.com/insights/search will redirect you to the new Google Trends. Google Insights for Search was a tool compare search volume patterns across specific regions, categories, time frames and properties. While it’s clear page speed is a ranking signal, you shouldn’t be checking and boosting your site load time just for the search bots. Do it for your visitors also. There are very few people that’d wait on a site that’s not up in at most five seconds. GTmetrix loads your site from different test server locations around the world. It displays your exact load time and grades your site based on a number of factors. And there are many of recommendations for you too. Enter a URL to check the status of all offsite links found on a page. The output will display status codes for each offsite link the tool can follow, including 404s and 410s, so you can find any broken links on the page. (a Moz app): This top SEO tool offers Twitter analytics, follower segmentation, social graph tracking. Followerwonk helps you explore and grow your social graph. Give your power graphics on who your twitter followers are, where they are located, when they tweet. Free website link Checker. Links on a web page very quickly become broken (link rot) because they get moved, deleted or changed, and other people that we link to do the same. Using a link checker regularly will improve your website’s user experience (UX) and search engine optimisation (SEO). Integrity is the free link checker for Mac. It’s OSX native, it is a very fast and accurate seo tool. The Keywords Everywhere extension is a free keyword research tool that shows you useful google keyword search volume and cost per click data on multiple websites. This tool saves you the hassle of copying data from various websites and using the google adwords keyword planner to see relevant search volume and CPC data. The tool also allows the user to get keyword metrics for any list of keywords and also lets the user download the list in Excel, CSV or PDF file formats. Keywordkeg helps you find low competition, easy to rank for keywords. Get access to Volume, CPC, and Competition from Google Keyword Planner. In addition to these, use our proprietary metrics to compare contenders in your keyword hunt. On-Page Difficulty (0-100): Measure of various factors that contribute to difficulty in ranking for the keyword based on the page’s content. The lower, the better the opportunity to rank. High quality link prospects.Gather all kinds of stats and insights with one click to check the value of potential links. You’ll see the value of the prospect by looking at its quality factors, such as Page/Domain Authority, Domain age, Alexa, social media metrics, etc. LinkAssistant makes sure you avoid all potentially harmful links. Easy outreach right from the app. Gather all contact emails automatically and contact link prospects straight away, right from the app. Use handy email templates for every type of outreach to make your emails feel personal, or create your own templates. Easily track sents and replies, flag important emails so you don’t forget to reply or follow up. Stay in touch without any effort and get the links you are after or delete the links you don’t approve of. One-click link verification. Run regular link checks to make sure your acquired links don’t get taken down, switched to no-follow, or have the wrong anchors. Contact partners right away if a link fails verification! Customised link building reports. LinkAssistant’s reports are customizable, white-label, and designed for all devices. You can easily share them with clients by uploading your report to the cloud and receiving a shareable link. Looking for a way to automate reporting completely? Set up a scheduled task, and LinkAssistant will build reports on autopilot and deliver them to clients on your schedule, as a direct link or attachment, in a plain text or custom HTML email. After latest Google Penguin updates, bad links can severely hurt your website rankings. Linkdetox can help you clean up your Link profile. Analyze your profile for toxic links! Now. Identify links that have highest likelihood of hurting your website. The Link Prospector tool uncover the links that will improve your rankings. Their Link Target Score algorithm ensures the best opportunities are available for your SEO strategy. $99/month seo services that uses artificial intelligence. Includes: Article creation, blog posts, backlinks, and on-page optimisation. One of the best SEO tools to check Back links and inbound links counter. You can compare up to 5 domains simultaneously and see who is getting more link growth. MajesticSEO offers a basic free plan as well as paid plans, and it “evaluates all links and helps separate high-quality links from low-quality links. The site also breaks down anchor text in a pie chart and is a great tool to see if your link anchor text is over-optimized. That is, whether Google would deem your anchor text wording an out-of-compliance attempt to spam or game the search engines. (Anchor text is the text within a hyperlinked phrase). Allows you to check your backlinks. You can also get send alerts when your competitors get a new backlink. Competitor keyword ranking checker is also available. One of the most complete and best SEO tools in the market, Moz tools offer a all the SEO tool set you need to ensure you get the best rankings on search engines including Google. These tools to help you optimise your local business listings, track your social media performance, conduct link research, access SEO metrics for any page, and more. A good way to analyze your chances with a keyword is looking at the top ten ranking pages for that keyword. And one tool that provides real-time data for that is the MozBar. MozBar is a Chrome extension developed by the Moz team that displays some of the Moz Pro metrics like DA and PA. DA is short for Domain Authority and is a trust gauge for websites in the eyes of the search engines. (Nobody knows for sure what Google or Bing thinks of a website, so DA, just like other metrics, is just an estimate.) PA, short for Page Authority is a rating of how trusted a particular web page is and it takes other metrics like the number of backlinks a page has and the referring domains to a page into consideration. When you install the MozBar extension, you’d need to login to your Moz account or create one if you’re a new user. Then refresh the search page so you’d get results with the MozBar. With Moz Link Explorer you can perform competitive link research, explore backlinks, anchor text, and more for free. this website allows you to check any website page rank, domain authority, page authority, alexa rank external backlinks count (inbound links count) referring domains and more. Check for duplicate content on the web. offers free website analysis tools in graphical format and provides recommendations for fixing problems. Rank Tracker is one the most advanced and powerful SEO tool for keyword tracking, keyword research and PPC analysis. Keyword Archive. Go back to any past date and check what the Google Page looked like. RankWatch through Keyword Archive gives you access to historical data for your keywords by keeping a screenshot of the Google SERP for you to refer to when you need it. This allows you to re-confirm your rankings and also enquire into whom else was ranking on that specific day. Great Insights on the Dashboard. The success of business decisions depends on the quality of information available. The CEO Dashboard allows these decisions to be taken more swiftly and with complete confidence as it helps top management get one single consolidated view of the complete business organisation. Through the dashboard marketers can understand the drivers of profitability and perform forecasting on various scenarios. Lastly, it will ensure that your business performance is measured and monitored using the correct check points. Advance Reporting. One of RankWatch’s strongest areas is its reporting structure, which can be accessed from almost every page on the tool and can be exported in multiple formats such as the basic Excel, CSV and PDF that can be customised completely to match your requirements. These reports can also be scheduled to be delivered at a certain date and time in the future depending on your choice and can be scheduled for delivery on a daily, weekly, monthly basis. City Specific Tracking. Get your rankings as precise as possible with location-based tracking and see what results your customer sees. Choose the search engine along with the specific city on which you want to monitor your keyword rankings. Geo-Specific Results. Thousands of Cities can be added. Email Alerts. Don’t waste time in searching for position fluctuations of your keywords. Get automated E-mail notifications of any change in your rankings by setting specific conditions on when you want to be notified of such changes through RankWatch Email Triggers. Instant notification of rank fluctuations, unlimited email addresses of recipients, notifications as soon as your keyword enters or leaves top 1/10/100 ranks. SEO Competitors Analysis. is all about going above your competitors website. RankWatch will assist you in doing just that by keeping a close eye on their online activities, organic or paid and report to you on a timely basis. We find out who your toughest competitor is and what ads they are running and how many keywords of yours they are ranking on. On top of that, we will give you a trend of what their online presence has been like and suggest you keywords that will give you an edge over them. Organic Competition, Paid Competition, Ad Copies, Keyword by Keyword comparison. Google Analytics Integration. RankWatch is fully integrated with Google Analytics, with the sole purpose to provide our users with inbound marketing data to make better strategically sound and informed decisions to improve their online performance. Website Analyser. Get your website audited and evaluated by RankWatch with a comprehensive in-depth analysis on what you are doing right and wrong with your website. RankWatch has just introduced its new version of Website Analyser, a module that focuses on conducting research into what makes a website stand out or makes it unnoticeable. It neatly informs and tests a website on extensive parameters ranging from Technology, Social Media and Mobile which are essential to score in order to get ranked and become more visible to users. Backlinks. On RankWatch, Backlinks are calculated in seconds and are displayed according to different parameters such as Newly Added Backlinks, Most Frequently Used Links to the Top Linking Domains.Deep Link Ratio, Site Wide Vs. Non Site Wide, Do Follow Vs. No Follow, Image Vs. Text, TLD Distribution, Strongest Page. Keyword suggestions. On RankWatch, you are not restricted to a certain number of keywords that you can track. But rather, we encourage you to track as many as you can, as it will not only allow you to identify but also provide you with more actionable data to carry on a successful SEO Campaign. Having an array of keywords will also allow you to monitor their performance over a period of time and optimise them instantly when the time is right. Long Tailed Keywords, Similar Phrases, City- Specific Results, Keyword Suggestions. “Low Hanging Fruit” Keywords. By working on 5 keywords, leads to other potential keywords getting affected. The only way you can perhaps track those 20-30 other keywords is via Google analytics, checking the traffic sources for your website. So, to save you all the time RankWatch has an awesome feature, which helps you identify hidden opportunities i.e. it will suggest those keywords, which you are not optimiSing, however are ranking well & should be suggested to your clients to consider tracking them as well. These will show up under the LHF page along with their broad-match search volume, their trend over a period of 6 months and their respected CPC’s. This top SEO Tool allows you to organise and entire link building campaign, view key SEO metrics about links, get updates about link status changes, it includes link screenshots for visually nicer reports and also can research link opportunities. Raven’s free 30-day trial provides an in-depth audit using its Site Auditor tool. “This will give you another tool to check your metadata, alt tags, headings, keyword usage, as well as a few additional data points. The report arrives in PDF format, and you can use it to measure progress as you fix site problems. Enterprise SEO platform for Search Engine Optimisation. tool for keyword optimisation for Amazon listings. This SEO Spider tool is a small desktop program which spiders websites’ links, images, CSS, script and apps from an SEO perspective. The tool fetches key onsite elements for SEO, presents them in tabs by type and allows you to filter for common SEO issues, or slice and dice the data how you see fit by exporting into Excel. 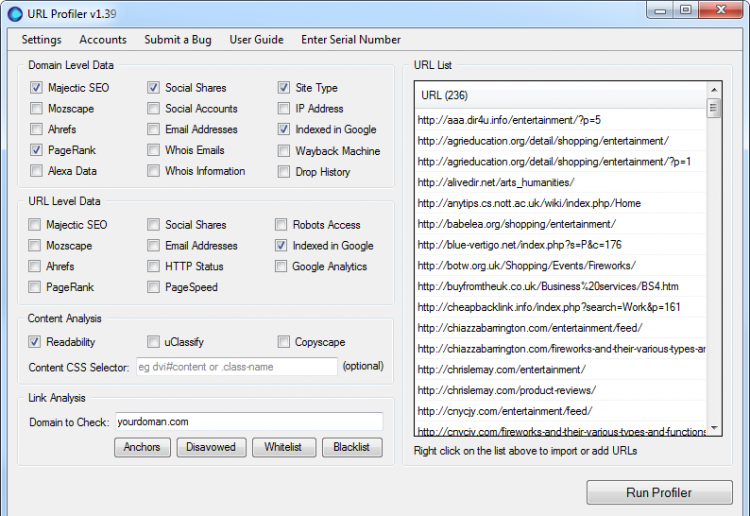 You can view, analyse and filter the crawl data. Simply enter your site’s URL and click ‘Start.’ clicking through each tab and using the built-in filters can give you a great idea of what might need to be fixed on your site. You can check your competitors most popular and influential pages. Scribe reveals other profitable keywords and phrases, tells you how gently tweak your content for search engines, helps you crosslink your content for usability and increase time on site and identify websites for link building. SEMrush SEO tool collects SERP data for million keywords and domains, including: AdWords ad copies and positions, organic positions for domains and landing URLs, search volumes, CPC, competition, number of results and more. They also provide customised data for a special project. Great tool to know the semantic grouping and user intent keywords giving organic traffic to competitors websites. SEMrush tool starts at $99/month as per Feb 2019. Check keyword density for any given page. tool that gives you keyword ideas. 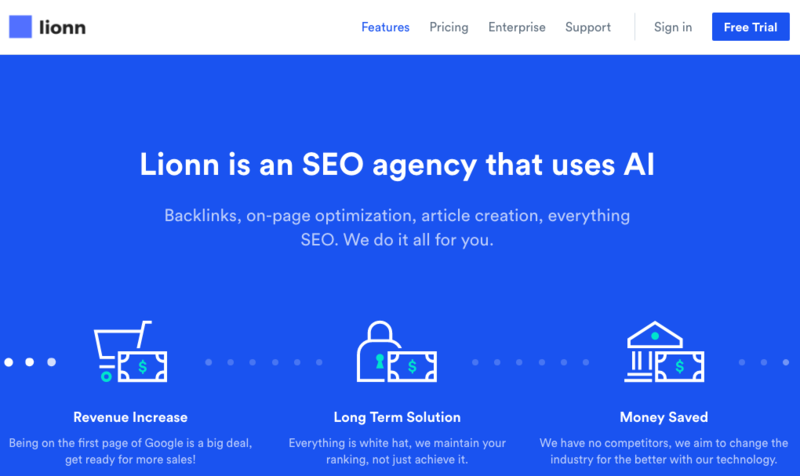 SEO Minion helps you analyze your On-Page SEO, check broken links, check URL redirects, improve CTR by previewing and editing your website’s title/description in real time, and checking the rank of your website in Google across multiple locations/languages (without personalization). It combines the power of many tools into one easy to use chrome extension. SEO PowerSuite is one of the most useful SEO software with unique analytic insight, letting you pick only the most profitable SEO tactics for your website. It can run lots of SEO tasks on autopilot, without your presence required. You can also find profitable, traffic-generating keywords to focus your SEO efforts on. free browser extension that allows users to perform a variety of SEO analysis and parameters, such as Alexa rank, SEMrush links, Google Index, Webarchive age, compare urls/domains, diagnosis reports, backlinks details, no follow links and many more for any webpage. you cna check your page authority and domain authority of any given page or domain name. With SEO SPYGLASS you can find, monitor, analyse and compare backlinks — dig all the data you need for safe and effective SEO link building. When you’re doing creating and posting your new piece of content, it’s time to start tracking your rankings on Google. SERPROBOT produces the search positions for your keywords. You can add up to five different keywords and filter by region. Allows you to change SERPS on a dummy search engine results and send the page to testers so you can have an indicative of how specific changes to positions and copy might affect CTR. This SEO Tool allows you to gather all of your SEO information in one place. SERPs, PageRank, Pages in main and supplemental index, back links, Twitter and Facebook mentions, social bookmarking, on page analysis and more. The tools also saves you time by automating your SEO activities including directory submission and communicating with relevant bloggers. You can also watch your SEO details from any platform including Windows, Mac or Cell/mobile phone (iphone). Track your positions in search engines over time and see what works and what doesn’t. obtain the most important traffic data for any industry in many countries; it also shows the traffic per sources, most popular sites per channel, and trends. Find out if your website and social media properties are properly mark up or not. you can compare keywords up to three competitors, and it will show which keywords you’re still not targeting for which these competitors are already ranking and the level of traffic opportunity and competition. By July 2015 this tools supports websites located in: USA, UK, Germany, Austria, Switzerland, Netherlands, France, Italy, Spain and Poland. is a free utility designed to help find duplicate content, broken links and other site issues that can negatively impact SEO. Results include: average page size, average page load time, number of words per page, text to HTML ratio, duplicate content, common content, internal links per page, external links per page, total links per page, inbound links per page. Allows you to create transcriptions from video to text. Great when optimising video content (seo for video tool) for search engines. you can search for any domain and see every place they’ve shown up on Google: every keyword they’ve bought on Adwords, every organic rank, and every ad variation in the last 6 years. Rank tracking and SERP analytics platform for SEO professionals. Pricing starts at $500 a month for first 5.000 keywords. Quoted at March 2016. You can track keywords by city, state, postal code, language and mobile. Rich snippets – Authorship verification included. Tag Assistant helps to troubleshoot installation of various Google tags including Google Analytics, Adwords Conversion Tracking, Google Tag Manager and more. Tag Assistant helps you verify that you have installed various Google tags correctly on your page. Just navigate to any page and Tag Assistant will tell you which tags are present, find any errors and suggest tagging improvements for your website. Use Google Tag Assistant Recording to record a typical user flow to and through your website and instantly validate, diagnose, and troubleshoot issues with your Google Tags. Check out any page speed issues and how to solve them. Find out where your competitors are getting social shared from. Help you find search term combinations. This tool suggests tons of related keywords for you by adding modifiers to your seed keyword. Enter a keyword, hit suggest and wait for the results. A powerful tool for SEOs to quickly audit links, content & social data. it can be configured to retrieve thousands of links, content and social data for almost any task. Great if you want to make a list of amount of backlinks for each url of your website and do some “SEO content pruning” and de-index pages with little seo value. These tools will allow you to safely browse internet from public locations. it provides annonymus IP address so your network and location is unknown. For SEO research it allows to choose from different cities around the world to see what Google localised results are. This is one of the top SEO tools that allows you to pick the most profitable keywords for your site. This tools will help you pinpoint high demand/low competition keywords and exploit them. You can also use this tool to spy on your competitors and analyse their SEO strategies. With this tool you will optimise your pages for high search engine rankings. Site errors are not good signals for Google Rankings — if your site has signs of poor quality, why would Google give you high rankings? Most SEOs do know this, but only very few are skilled to identify and fix all site errors. Website Auditor helps you avoid any on-page problems and ensure stable, effective and best SEO. Website Auditor can find all technical issues that are lowering your search engine rankings, it will show you how to fix them. You will be able to see how your competitors are handling on-page seo and you can also get keyword usage advice for each of your pages. Find and fix all your website seo issues — and make your site rank higher in search engines! This tool allows you to find out the website owner of an Australian website. WooRank SEO tool is a popular Website Review and SEO Tool. You can run a free review. You can also create an advanced Review to track and optimise your website. (free) is for sites that use the open-source WordPress.org CMS, and it can automatically fix and streamline many technical errors a site might have without too much technical knowledge needed. You can also use it to enter your HTML title tags and meta descriptions. CSV Spreadsheet (by Distilled). This great SEO tool for Youtube video and spreadsheet will help you to easily create a custom Youtube Play list. Saving you a great amount of time.